Outlook Web Access in Exchange Server 2010 offers integrated instant messaging capability right from the browser. You also see presence information against each contact in an email header. My initial search fetched a Microsoft KB article 919166, which deals with exactly the same problem. However, unlike the conditions mentioned in the article, the locale on my domain controller and Exchange servers are the same and my domain controller has Windows Server 2003 Service Pack 2 which supersedes the mentioned hotfix. 3. Right click on CN=Directory Service and choose Properties. 5. If you see a string value DisableVLVSupport=1, remove it and change it to DisableVLVSupport=0 and add it back. Click OK all the way out. Replicate the changes across all your domain controllers. You should now be able to open your address book. This post discusses a common Outlook Web Access (OWA) calendaring issue reported at most forums. I could not find a satisfactory answer posted anywhere, including eventID.net, so I thought I’d share the knowledge. This action can’t be performed. One or more of your reminders cannot be snoozed or dismissed. As per Microsoft KB 310440, check if the required registry keys are intact. Make sure your antivirus software is excluded from doing realtime scanning on Exchange database/log files. 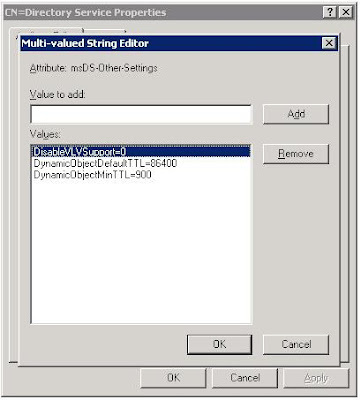 Open the affected user objects attributes in ADSIEDIT. Make sure that the legacyExchangeDN attribute is in order. 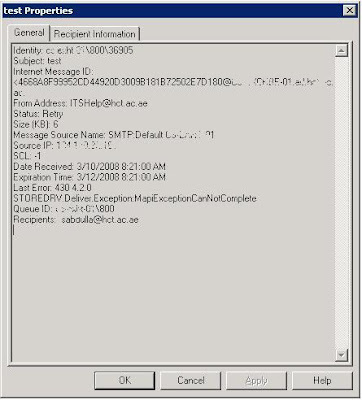 If you move a mailbox with a malformed legacyExchangeDN attribute to Exchange Server 2007, the user will not receive meeting requests/updates. These will get stuck up on the queue with a 430 4.2.0 “STOREDRV.Deliver.Exception:MAPIExceptionCanNotComplete” error. By default, Microsoft Outlook Web Access shows all address lists in Active Directory, regardless of the permissions that are set on the address list. To restrict access so that users can only view the address lists that are contained in their own OU, you can configure the msExchQueryBaseDN attribute for the OWA user. In an Active Directory environment with a large number of users where there is a need to filter the long list to just a number of relevant recipients, this is particularly useful. Find the msExchQueryBaseDN attribute. 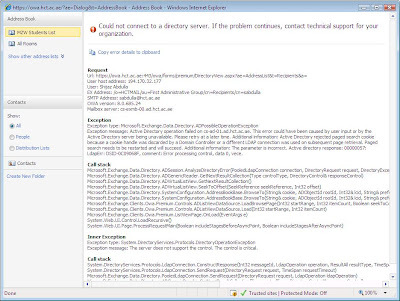 Enter the DN for the OU or restricted Address list you want the user to see in OWA. To enable user to see all lists, just clear the field. If you want to edit msExchQueryBaseDN attribute for a large number of users (entire OU or domain), you can use the ADModify tool.